Killer Sudoku (also called Sum Sudoku) are a kind of hybrid puzzle that combine the best features of Sudoku and Kakuro (cross-sum) puzzles. Like a regular Sudoku, the rows, columns and 3x3 blocks contain the digits 1 thru 9. In addition, the dotted lines indicate areas, called cages, which also contain a set of non-repeating digits. If you add up the digits in a cage, you get the sum shown in its clue. 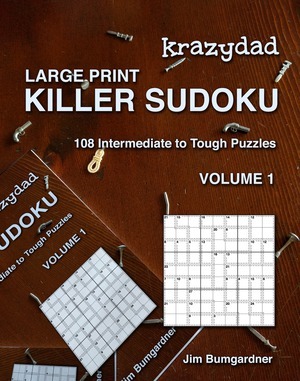 My Killer Sudoku puzzles are collected in 100 printable booklets per volume. Within each volume, the puzzles are also ordered by ascending difficulty (book 100 is harder than book 1, but book 1 volume 9 is about the same as book 1, volume 1). Each booklet contains eight puzzles, instructions, and answers. Need a cheat sheet? Print out this one-sheet of candidate cage sets which makes it easier to eliminate numbers. My new series of Killer Sudoku books, available in 4-per-page and Large Print 1-per-page formats, are now available on Amazon. A variety of skill levels are available. Your purchase (and Amazon review) helps support this website! 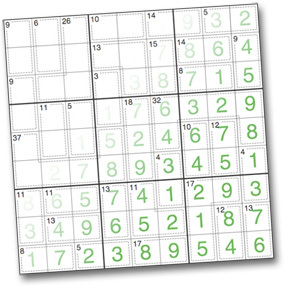 These puzzles require basic Sudoku strategy and Kakuro strategy. If you have not solved Kakuro puzzles before, you will probably find them quite difficult at first. These are the toughest Killer Sudokus I make, and may require a little trial-and-error to finish. Wait, didn't I just say the Super-Tough puzzles were the toughest I make? Well, I must be insane, because these new ones are actually even harder.